Our pre-school group is confident, loving, creative and ready! The last couple of years before school begins are so important and it is up to us at Foxcubs Day Nursery to prepare your little one ready for their next big leap. The key persons in pre-school, are experienced and qualified and know that from birth, all children are working towards the Early Learning goals. As in all the departments, the staff in pre-school plans a mix of adult led and child-initiated activities. They know that children learn at different rates and in different ways and encourage children to be independent learners. Every child is unique and we at Foxcubs Day Nursery recognise this. There is also an outdoor area attached to the main room, so the children can free flow from indoors to outdoor. The children love to be outside and are growing lots of wonderful flowers and vegetables in our forest school. Staff provide a balance of planned and unplanned opportunities both indoors and outdoors that will allow the children to think critically and be confident learners. 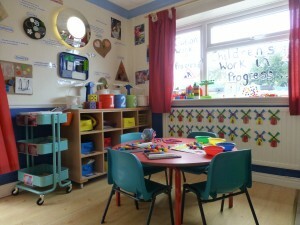 Pre school children have access to a wide range of activities and resources which includes I.T. in our library area.